Countless fans joked that it would only be a matter of time before Vitor Belfort (pictured) pulled out of his UFC 173 title fight against middleweight champion Chris Weidman with an “injury” after the Nevada State Athletic Commission voted unanimously to ban testosterone replacement therapy (TRT) on Thursday. Well, Belfort took a different route but ultimately ended up where fans predicted. A healthy Belfort announced on tonight’s edition of “Fox Sports Live” that he will withdraw from the May 24 scrap because he won’t be allowed to use TRT. “The Nevada State Athletic Commission recently altered its policy and no longer will permit testosterone use exemptions, and will not permit a TRT program,” Belfort expressed in a statement. “As other jurisdictions may follow suit, I am going to drop my TRT program and compete in MMA without it. 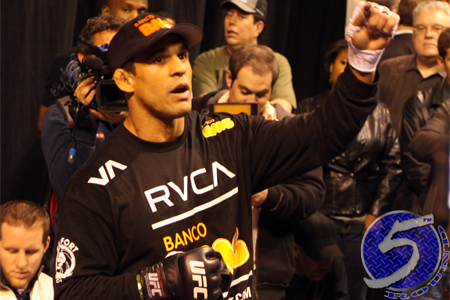 Former light heavyweight champion Lyoto Machida gladly stepped in to take “The Phenom’s” place. Shortly after the NSAC banned TRT, the UFC issued a statement in support of the monumental verdict. The planet’s premier mixed martial arts promotion proclaimed they would follow suit by forbidding their fighters to use TRT on any out-of-country event the UFC oversees when a governing body isn’t available. In addition, the NSAC and UFC both expressed their desire to have all other state athletic commissions ban TRT. UFC 173 takes place inside MGM Grand Garden Arena in Las Vegas, Nevada.